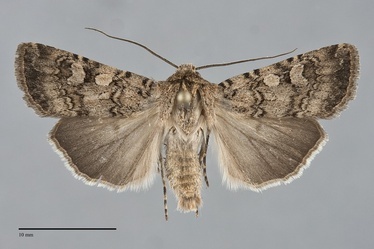 Euxoa simulata is a small to medium-sized gray-tan Euxoa (FW length 14–17 mm), usually with a warm yellow to orange cast, dark double lines and filling of the cell, light-filled spots, and a heart-shaped reniform spot that flies at middle elevations during the summer. The forewing is relatively smooth with only a light sprinkling of darker scales. The costal subterminal area and terminal area other than the apex are darker gray, as is the filling of the cell. The basal and antemedial lines are dark gray to black, double with components of similar strength, filled with the ground color, and slightly irregular. The antemedial line is nearly perpendicular to the posterior margin. The median line is dark gray, usually as dark as the other lines, narrow and irregular on the posterior wing. The postmedial line is double with dark evenly toothed inner and faint, diffuse, and smooth outer components, drawn basad on the costa, laterally convex near the reniform spot, and angled slightly toward the base below the spot. The subterminal line is pale yellow-tan, slightly irregular with an offset below the apex and weak W-mark on M3 and CuA1. It is preceded by a dark gray shade that is strongest on the costa and mid-wing, sometimes condensed into diffuse spots. The terminal is dark, thin or a series of black spots. The fringe is concolorous with the terminal area. The orbicular and reniform spots are partially outlined in black, are moderately large, and are filled uniformly with light gray-tan. The orbicular spot is slightly oval, often open toward the costa and posterior margin. The reniform spot is heart-shaped with an asymmetric long lower end that extends to the postmedial line. The claviform spot is black, small or absent. 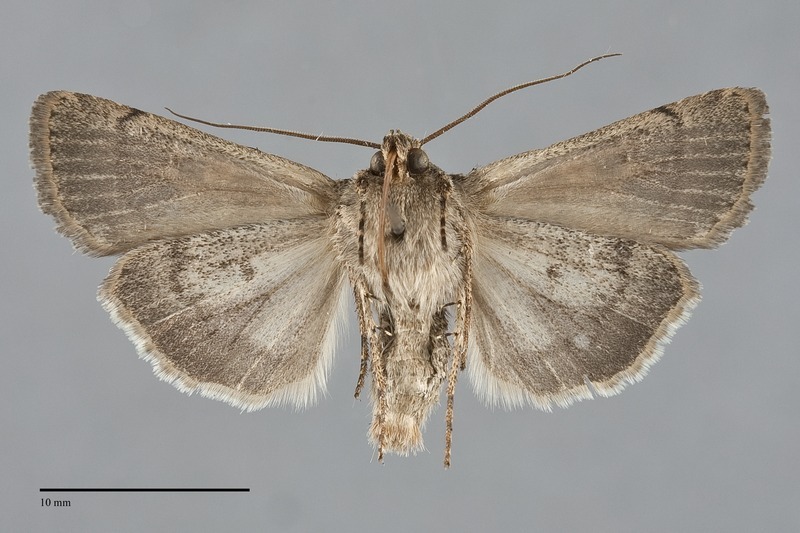 The hindwing is brown-gray, with barely darker margin, veins, discal spot, and terminal line. The hindwing fringe is off-white with a darker base. The head and thorax match the forewing color, with a very weak black transverse line across the mid-collar. A frontal tubercle is present. The male antenna is biserrate. Euxoa terrenus is placed in the largest subgenus Euxoa. Euxoa simulata is named aptly because it is similar to many other brown Euxoa species. It can usually be distinguished by the combination of warm brown color, double dark lines with components of similar strength, dark-rimmed and evenly pale-filled spots, and heart-shaped reniform spot. 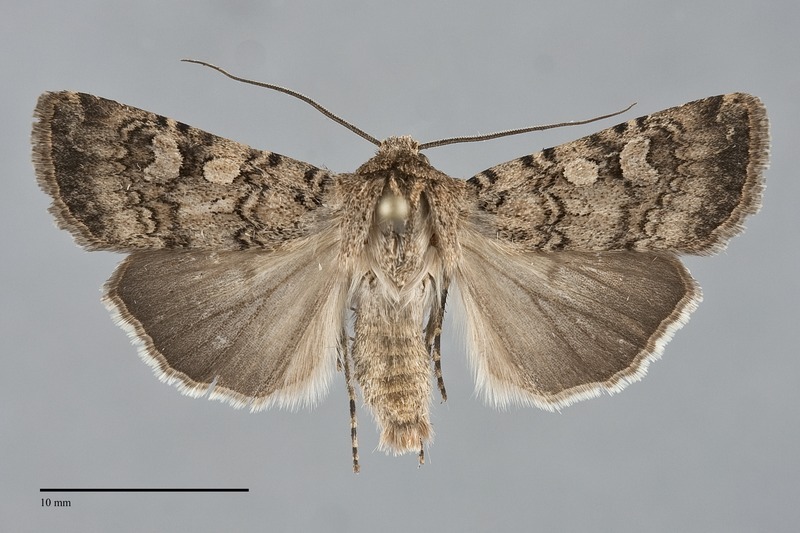 It is most likely to be confused with Euxoa terrenus, a much more common and widespread moth. It is usually darker and more powdery brown and has a kidney-shaped reniform spot with filling that is similar in darkness to the ground color rather than light. Euxoa extranea, a species of the high Cascades, has similarly shaped spots as E. simulata. It is usually large and is grayer. Its spots are also filled with gray, not yellowish tan. The spots of Euxoa setonia are usually similar to those of E. simulata in color, but lack dark outlines. This species also has a dark median band that dominates the dark wing markings. Structurally, males of E. simulata have stouter and straighter saccular extensions than those of most similar species, especially E. terrenus, which can be observed under magnification after brushing the scales from the tip of the abdomen with a small brush. This species is widely distributed in dry coniferous forests throughout much of western North America, but is usually rare. In the Pacific Northwest, it is most common in ponderosa pine forests and on middle-elevation ridges. Euxoa simulata is found in dry forests south of southern British Columbia in our region. It has been collected in the Cascade Range, in the Blue Mountains, and in south-central Idaho. This species is found predominantly west of the Rocky Mountains. The eastern limit of its range is an imaginary line drawn from the Okanagan region of British Columbia to New Mexico and western Texas. It occurs as far south as southern California, but is absent from the immediate Pacific Coast. This species flies predominantly during the summer. Records from the Northwest extend from mid-June through mid-September. It is nocturnal and comes to lights.